Sugar white sand and emerald green Gulf waters bring many beach seeking families and couples to the Emerald Coast each year. What better way to experience the magnificent natural beauty than staying right on it? Spending your vacation in a hotel on the beach in Destin is an experience that you will truly cherish for years to come. Stepping out on to your private balcony and taking in the shimmering waters and listening to the relaxing waves lapping on the beach shore is truly the best way to unwind and leave all your cares behind. With such a beautiful coastline it is a common misconception to think that Destin Hotels on the Beach are abundant. There are actually a handful of hotels on the beach in and around Destin. On this site we've highlight locations that are directly on the beach. No streets to cross or extended walks, all the hotels featured are front and center and right on the sugar white beach sand. Be sure to reserve you Destin Vacation online to lock in at the lowest rates. Book your hotel and start packing- the beach is waiting! The only hotel on the beach in Destin located in the heart of town. The Holiday Inn offers guests a chance to experience the charm of what made this location one of the top beach destinations in the country. Choose from direct beachfront accommodations or save some money and select beach view or city view rooms. The premier resort on the beach in Destin is hands down the Sandestin Golf and Beach Resort. 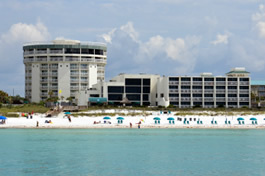 The Sandestin Hilton is the only hotel on the beach in Miramar Beach. Featuring an unmatched selection of amenities a vacation to this location is sure to please even the most sophisticated traveler. The first reaction of guests arriving at the Ramada Plaza is "WOW." 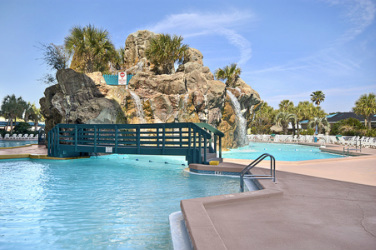 This is the only hotel on the beach in the Destin area that offers a large lagoon pool with a central waterfall and swim up bar. 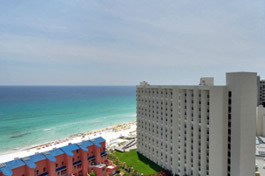 The Ramada is located just west of Destin on Okaloosa Island. Enjoy the same white beaches and clear emerald waters.